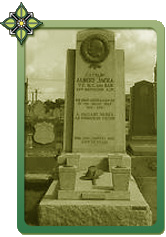 Albert Jacka was seven years old at the time of Federation and died at only 39 years of age. The winner of the first Victoria Cross at Gallipoli was held in enormous esteem during his short life and his popularity continues today with annual public gatherings at his grave. The adulation of Australia’s greatest front line soldier indicates the importance of war in fashioning national identity. Although nationalist sentiment was strong during the Boer War 1889 -1902, it was the Gallipoli campaign that created an immense pride in being Australian. Jacka’s personal character is seen as the ideal of an Australian ethos: ‘the Anzac creed of mateship, bravery, fairness and an absence of pretentiousness’. 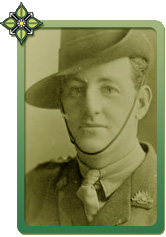 Jacka met his destiny at Anzac Cove, Gallipoli Peninsula early in the morning of the 19th May, 1916. The child of a Victorian labourer, he had enlisted with his two brothers as a private in the 14th Battalion Australian Imperial Force. At 4 am the Turks attacked along the entire line and rushed Jacka’s trench. His three companions were hit but Jacka returned fire and organised a counter attack. While others distracted the enemy, he single-handedly attacked the Turks from the flank, shooting five and bayoneting two. Receiving the first Victoria Cross awarded to the A.I.F, Jacka became an instant national hero. He was eventually promoted to the rank of Captain. In 1916 at Poziers, France, Jacka received the Military Cross for what was described by war historian C.E.W Bean as “the most dramatic and effective act of individual audacity in the history of the A.I.F”. On 7 August Germans attacked his dugout killing two soldiers. Jacka counter-attacked furiously with his platoon rescuing forty Australians being rounded up as prisoners, capturing fifty Germans and retaking the line. After recovering from serious wounds he saw further action and in 1918 was gassed at Villers-Bretonneux. He returned home to a hero’s welcome and established an electrical goods business with A.I.F comrades. In 1921 he married Frances Carey and settled in St Kilda. 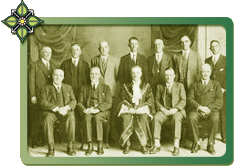 He became Mayor of St Kilda in 1929 using most of his energy to assist the unemployed. He believed the role of local government was to actively support the disadvantaged and made the Town Hall available to store the possessions of those evicted from their homes during the great depression. St Kilda’s most popular son died of nephritis at Caulfied Hospital on 18 December 1932. Nearly 6000 people filed past the coffin at Anzac House. One thousand returned soldiers led the funeral procession and eight Victoria Cross winners were pallbearers. The sculpture and memorial plaque for his grave was paid for by public subscription. Jacka Boulevard bears his name.